These days, more and more people are looking for ways to supplement their income. Others find the demands of a 9-to-5 corporate job unrewarding and frustrating. Not to mention, realizing that you’re building someone else’s fortune instead of your own can be defeating. Here’s an idea: consider a career in network marketing. Why? It’s simple – financial freedom and living a rich and rewarding life are attainable goals. You don’t have to choose between one or the other. 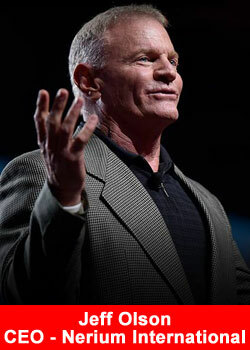 To prove my point, I recently had the pleasure of interviewing one of the great minds of network marketing: Jeff Olson. Jeff Olson is the Founder and Chief Executive Officer for Nerium International – an award-winning company providing age-defying skincare and wellness solutions based in Addison, Texas. Over the past 30 years, Jeff has helped hundreds of thousands of individuals achieve better levels of financial freedom and personal excellence. Working with a series of sales, marketing, and distribution companies, Jeff successfully built three different sales and distribution forces into multimillion-dollar organizations from scratch, ultimately becoming CEO of one of them, Nerium International. Jeff, what inspired you to get involved in network marketing 25 years ago? “I’ve been many things in my life: a college dropout, a beach bum, and complete financial failure, straight-A student, top corporate manager, super-achieving entrepreneur in a cutting-edge industry, and complete financial success. Through these experiences, I’ve always thought of network marketing as having the perfect business model. For starters, your own business in network marketing requires minimal costs and in return offers maximum earning potential. It just makes sense. You work when you want, where you want, for the number of hours you want. Jeff, who can benefit from a career in network marketing? “Here’s something that piqued my interest: Whether you’re in it part-time or full-time; the opportunity is available to anyone, regardless of education, location or circumstance. What do you value most about network marketing? Jeff, why do you think Nerium has been so successful in such a short period of time? “Since the company’s founding in August 2011, Nerium has experienced explosive growth in sales and we’re only getting started! By 2012, Nerium ranked the #86 MLM out of 100 by Direct Selling News and earned over $100 million in revenue. Only a year later, Nerium’s ranking improved up to #54 with earnings of more than $200 million in sales. Since then, we’ve launched our products in 12 countries. We’ve expanded globally and we’ve added more age-defying skin care and wellness products to an innovative and popular product line. At Nerium, and really in my personal life too, I believe in one equation: the right philosophy requires the right attitude which will motivate you to commit the right actions. Nerium is built on this foundational equation. I also call this: The Slight Edge. We support our Brand Partners with a variety of marketing tools and opportunities for personal development and we create a happy company culture that promotes a growth mindset. But, I think, above anything else, Nerium has been so successful in such a short period of time because everything we do is based on the philosophy of Making People Better. Not only do we offer proven, age-fighting products but also breakthrough entrepreneurial business opportunities. Nerium International has recently expanded to many new markets; what has been your expansion philosophy when it comes to international? “From day one, Nerium has spent years and millions of dollars developing a proprietary software system that can onboard information from new countries, plus support Nerium’s independent Brand Partners and customers without complication. The intent was always to expand beyond the borders of the United States. We’re Nerium International after all. Not to mention, our international product line has been hugely successful. Your message to the world is Happiness – what do you mean by that? “What most people don’t realize is that happiness really is a precursor to success. You don’t need an Ivy League education, 18-hour work days, or a bottomless pit of financial or human resources to be successful or happy. Instead of thinking about happiness as the result, I try to show people to think about happiness as the precursor to everything they’ve ever wanted. Science backs me up on this and studies suggest that we’ve been overlooking one easy but significant component for obtaining success: happiness. Research in the field of positive psychology has revealed that happiness fuels success and being happy reprograms our brains to be more positive, which results in more engagement, more productivity, and more efficiency in what you do. As part of my journey, I want to help people discover their personal journey of happiness in life, at work and at home. Happiness empowers us to make the positive difference in our lives and in the lives of others. We have embedded happiness in our culture at Nerium through a partnership with Live Happy. Happier people are healthier, more satisfied with life and their relationships, and they even live longer! Your belief is that personal development is very important for a Direct Seller, why do you believe that? “Personal development is a huge part of what Nerium International offers to our Brand Partners. Ongoing training and support are crucial to help direct sellers achieve success in their business. At Nerium, we have a company culture in which we provide our team members with the necessary tools and resources to make a success of their personal and professional lives. Being an entrepreneur is not easy! You must have a growth-mindset to succeed in this business. You must have a willingness to learn, grow, change, read, and study on a continual basis. Without the proper support, it’s easy to think you’re failing instead of understanding and appreciating how your perceived failure is in fact guidance for your next step. It’s easy for us to forget that if a door shuts, it wasn’t ours to open in the first place. If you have any additional questions for Jeff, you can reach him on Facebook at www.facebook.com/JeffOlsonFan/ or @JeffOlson on Twitter. Based in Addison, TX, Nerium International is a global relationship marketing company with age-fighting products crafted from cutting-edge research and science. Founded in 2011, Nerium International has shattered industry sales records while developing a strong customer base in North American, Latin American and Asia-Pacific markets. This unprecedented success has allowed Nerium International to generate $1.5 billion in cumulative sales after just five years. Nerium International was recognized for its historic growth by ranking No.1 on the 2015 Inc. 500 List of fastest-growing private U.S. companies in consumer products and services and No. 12 in overall, as well as No. 38 on the 2016 Direct Selling News’ Global 100 List. Led by an executive leadership team with vast domestic and international experience, Nerium International is committed to providing an excellent product line based in real science and providing its Independent Brand Partners with a life-changing and outstanding business opportunity through relationship marketing. For more information, please visit: www.nerium.com. Get more information, fact and figures about Neora, click here for the Neora overview.